On the 750-kilometre walk along the Chemin de Saint-Jacques you’ll pass dozens, perhaps hundreds, of churches, chapels and cathedrals. 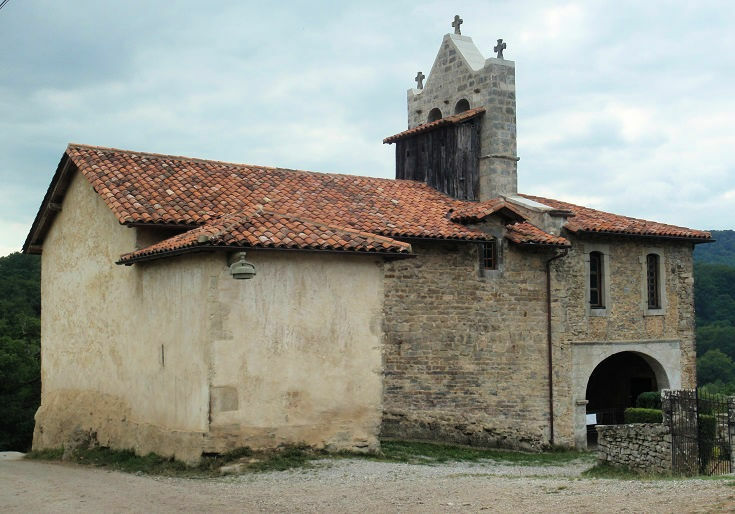 But if you call in to only one on your way from Le-Puy-en-Velay to Saint-Jean-Pied-de-Port, make it Chapelle Saint-Nicolas in Harambeltz. Most walkers pass through the tiny hamlet of Harambeltz with barely a sideways glance. If it’s approaching midday, you might consider taking advantage of the shade provided by the covered porch of the rustic church to rest your feet and enjoy a picnic lunch. And yet, as I thought about how I would structure my suggested itinerary along this section of the GR 65, an overnight stop in Harambeltz was the first thing I locked in. Everything else was made to work around it. First impressions are likely to be of a small farming community, much like the 200 or so you have passed along the first 700 kilometres of the Chemin de Saint-Jacques. Just beyond the last house is a church – dedicated to Saint-Nicolas – and, let’s face it, you’ve passed a good many of those also! From the outside, the building is an odd mixture of stonework and patched stucco. Most of the current church dates from the twelfth and thirteenth centuries, although stones around the base of the building are thought to be much older – remnants of the original church built in the ninth or tenth century. In the seventeenth century, the sacristy was added on the eastern wall, but 300 years later, the building was in much need of repair. In 2001, the church was classified as an Historic Monument. Five years later, the local villagers formed an association – Les Amis d’Harambeltz – dedicated to preserving the building. Much-needed grants from local and regional governments added to funds provided by the villagers and, in June 2008, restoration work began. By December 2010, the project was complete and the church was reopened to the public shortly afterwards. Inside the church is a feast for the eyes. Faux marble walls are festooned with carvings, paintings and statues in shades of orange, apricot and blue. It’s hard to know where to look first, so take your time and linger – soaking up the atmosphere and exploring all the details. The church is open to visitors on Tuesday and Thursday afternoons between two and six o’clock from Easter until 1 November. During these times, a member of the community is present to show visitors around and answer questions. You are, of course, welcome to look around on your own. Entry is by donation and proceeds fund the continued maintenance of the church. Visits outside of these hours can be arranged for groups of ten or more. Contact details are available here. 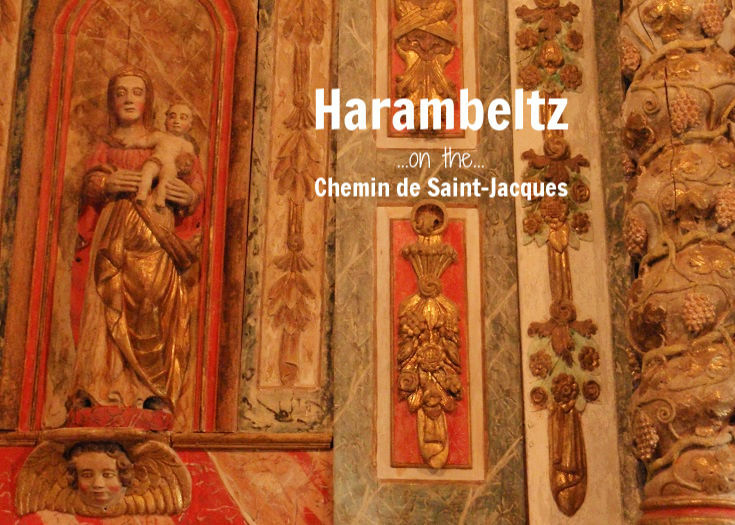 The Friends of Harambeltz website includes a detailed description of the church, its history and the restoration that has been done (en français). Let’s take a closer look! If you arrive in Harambeltz via the variante that passes through Uhart-Mixe (as the majority of walkers do), you’ll miss another, less well-known gem along this section of the Chemin de Saint-Jacques. Instead of turning left towards Harambeltz when the variante reaches the GR 65, turn right and continue along the GR 65 towards Stèle de Gibraltar. 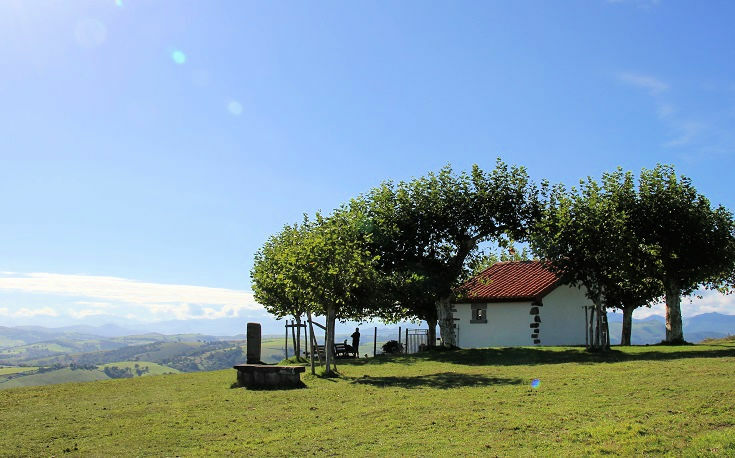 After fifteen minutes of gentle uphill walking, you’ll arrive at Chapelle de Soyarza. The chapel is small but the views are magnificent and well worth the extra time required to visit. Harambeltz is 24.5 kilometres (15.3 miles) from Aroue and I recommend spending the night here on the eighth day of this stage of your walk. There is no Tourist Office in Harambeltz (in fact, there’s not even an intersection!) but if you visit on a Tuesday or Thursday afternoon you’ll find helpful locals ready to show you around the chapel. More information can be found on their website. Maison d’hôte Etchetoa accommodates only six people (two rooms) so book early. If you prefer not to plan ahead and find the chambre d’hôte is fully booked, the next village of Ostabat-Asme is four kilometres (2.5 miles) further along the path. If you arrive in Harambeltz around lunch time, you’ll need to come prepared with your own picnic supplies but you’ll find shade and shelter under the porch at the entrance to the chapel. If you are staying overnight at Maison d’hôte Etchetoa, be sure to include the table d’hôte when you reserve your room.